John Smith, artist and lecturer. Born in Walthamstow, east London in 1952, Smith studied film at the Royal College of Art. He was inspired in his formative years by conceptual art and structural film, while also being fascinated by the immersive power of narrative and the spoken word. Since 1972 Smith has made over forty film, video and installation works that have been shown internationally in galleries, cinemas and on television. Often rooted in everyday life, Smith’s meticulously crafted films rework and transform reality, playfully exploring and exposing the language of cinema by subverting the perceived boundaries between documentary and fiction, representation and abstraction. Solo exhibitions include Centre d’Art Contemporain de Noisy-le-Sec, Paris (2014), Kestnergesellschaft, Hanover (2012), and Royal College of Art Galleries, London (2010). 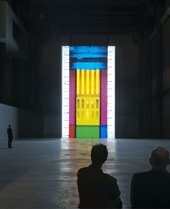 Major group shows include Image Counter Image, Haus der Kunst, Munich (2012), Has The Film Already Started?, Tate Britain (2011), and Berlin Biennial (2010). Smith’s work has been awarded major prizes at many international film festivals and has been profiled through retrospectives at festivals in Oberhausen, Tampere, Leipzig, St Petersburg, La Rochelle, Mexico City, Uppsala, Cork, Sarajevo, Regensburg, Stuttgart, Vilnius, Karlstad, Winterthur, Bristol, Hull and Glasgow. Smith received a Paul Hamlyn Foundation Award for Artists in 2011 and in 2013 was the winner of Film London’s Jarman Award. John Smith lives and works in London and currently teaches part-time at the University of East London where he is Professor of Fine Art. His work is held in numerous public collections including Arts Council England, Tate, Ella Fontanals-Cisneros, Kunstmuseum Magdeburg, Wolverhampton Art Gallery and Ferens Art Gallery, Hull, and is distributed by LUX, London, Video Data Bank, Chicago and Light Cone, Paris.